Energetic, inquisitive, bold, feisty, playful, mischievous, independent and adventurous describe the fox terrier. This breed lives to run, chase and explore. It is usually fairly reserved with strangers. It tends to bark and dig. 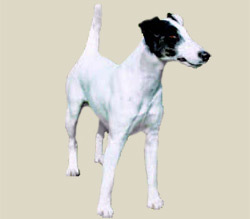 The smooth fox terrier is energetic and cannot be ignored. As an active dog, it will do much to exercise itself given the room. It enjoys a vigorous game or walk, as well as an off-lead outing in a safe area. Even though this breed can live outdoors in a warm climate, it does better living in the house and playing in the yard. Smooth coat care consists of weekly brushing to remove shedding hair. In fact, the smooths shed more than the wires. Some training of the ears may be necessary as puppies for proper adult shape to develop. The short coat of the Smooth Fox Terrier is easy to groom. Brush with a firm bristle brush, and bathe or dry shampoo when necessary. This breed is an average shedder.